Jimi Hendrix and Rock Band: it's official! Soon Jimi Hendrix will be a Rock Band avatar. Hey, what about 3-D? Jimi Hendrix is officially coming to Rock Band. Last month, Janie Hendrix, Jimi's stepsister and CEO of Experience Hendrix, confirmed to MusicRadar that "a Jimi Hendrix Rock Band is definitely is in the works," and now a deal has been made. In combination with Harmonix, MTV Games and Experience Hendrix, all of Jimi Hendrix's iconic recordings will be available as downloadable content, starting with the guitarist's second album, Axis: Bold As Love, along with the single Valleys Of Neptune on 30 March. "Much like Jimi's music, we feel that Rock Band represents an amazing, innovative medium for music discovery and interaction that can have a profound affect on those who experience it," said Janie Hendrix. "We are extremely pleased to be able to have Jimi Hendrix's genius musical legacy continue to live on and touch people the world over through Rock Band." Paul DeGooyer of MTV Games told Rolling Stone that "Hendrix's music is something that our fans and supporters have been clamoring for on the Rock Band platform." 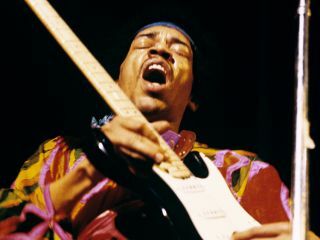 In addition to CD/DVD remastered versions of Hendrix's first three studio albums, Rock Band will also issue the posthumous album First Rays Of The Rising Sun. "The remasterings of the catalogue are really incredible and you can hear stuff for the first time in those recordings and we're kind of the beneficiary of that," DeGooyer told Rolling Stone. He added that the Rock Band tracks will also boast "improved sonics." It is said that Rock Band has worked out an agreement with Experience Hendrix for an avatar of Jimi Hendrix to be featured in a full-fledged Rock Band: Jimi Hendrix-style game similar to The Beatles: Rock Band. As to what kind of guitar the six-string legend will play, Janie Hendrix told MusicRadar, "We're good friends with Fender, so we'll be keeping it authentically accurate." We take this comment to mean that a Stratocaster will definitely be in the hands of the Jimi Hendrix avatar.